If you’re new to Saint Martin, it’s important to know that it’s a dual-nation island, with the north half French and the south half Dutch. 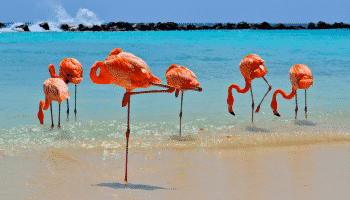 Like many Caribbean islands, it was badly damaged from Hurricane Irma in 2017, but now that the island has largely recovered, tourists are visiting in droves. The mix of cultures here makes the food scene unparalleled, so we rounded up the top 10 restaurants so you know exactly where to dine on your beach vacation. With everything from Italian to Asian to Greek, we’re sure you’ll find a meal that hits the spot. Sale e Pepe is the ultimate restaurant for incredible, authentic Italian dishes. It’s a bit on the pricey side, so this is a good spot for a romantic dinner or special occasion. 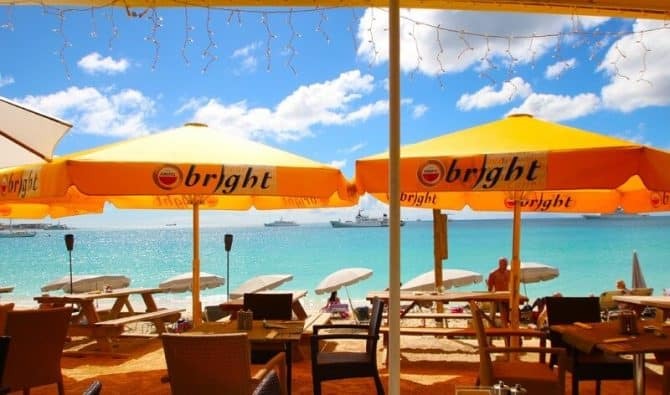 The restaurant has an ideal location right near Kim Sha Beach and Buccaneer Beach Bar, with views of the Simpson Bay Bridge, so you can easily walk over for dinner after a day in the sun. 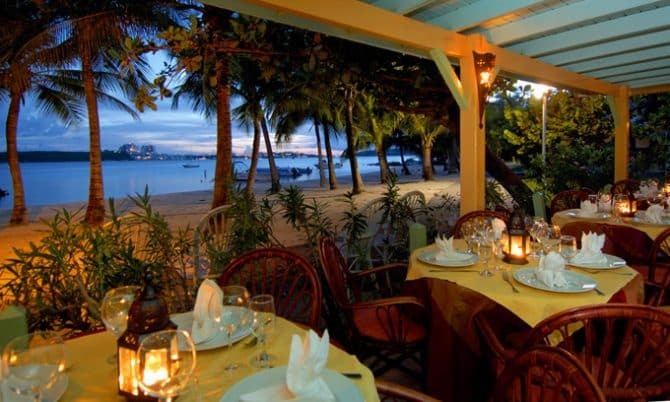 Karakter is a beach bar and restaurant located on the pristine white sands of the mile-long Simpson Bay Beach. Karakter is also easily accessible from the Maho area too. 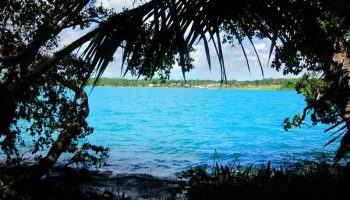 Make a day of it and lounge on their beach chairs while enjoying delicious cocktails, small bites and gorgeous blue water. In the evening, you can take part in candlelit seaside dining and a fun atmosphere. On the weekends, it becomes a lively party scene with music and dancing after 3 pm. 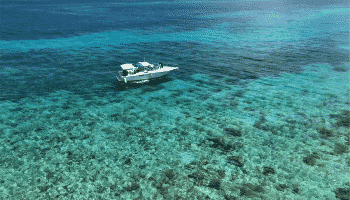 Since Karakter is right near the airport, it’s the perfect spot to spend your last moments in paradise. Craving some sushi? 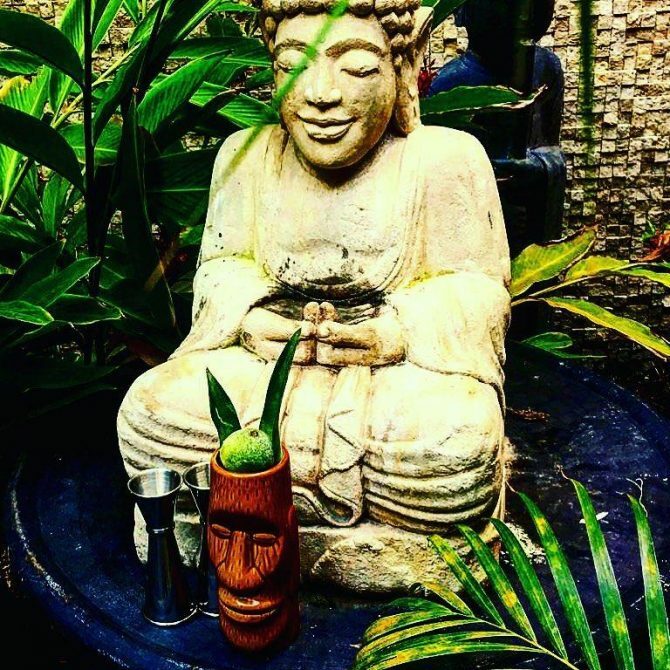 Little Bamboo is an edgy spot in Simpson Bay with great sushi and craft cocktails. It is an offshoot of popular restaurant Bamboo, which was destroyed during Hurricane Irma. The main difference between the two restaurants is the smaller size, as Little Bamboo offers most of the same classic menu items, ambiance and quality as Bamboo. 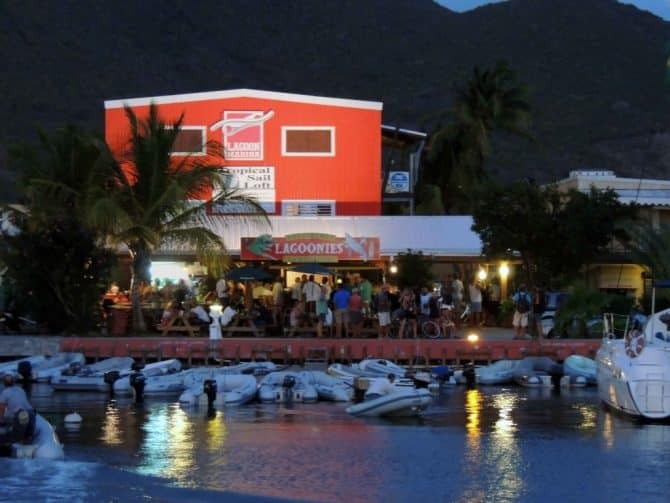 Lagoonies Bistro and Cafe is a favorite among locals and tourists alike, but specifically among the sailing community since it’s located right on the shore of Simpson Bay Lagoon at Lagoon Marina. Lagoonies often has live music (check their social media pages for event info) and they are known for unique seafood dishes. 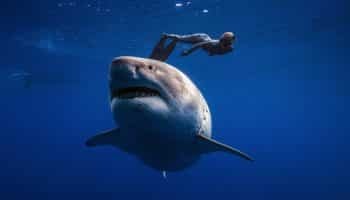 While it’s a little bit off the beaten path for land-based visitors, it’s worth the extra few minutes of driving to get from Simpson Bay to Cole Bay. Be sure to make a reservation and ask for a table on the water. 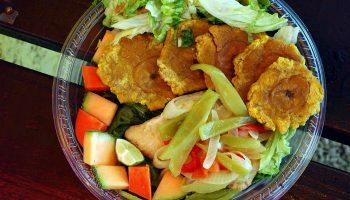 For those based in Phillipsburg, Lagoonies is only a 30-minute drive, so it’s a good spot to eat dinner when you are spending the day in Simpson Bay. 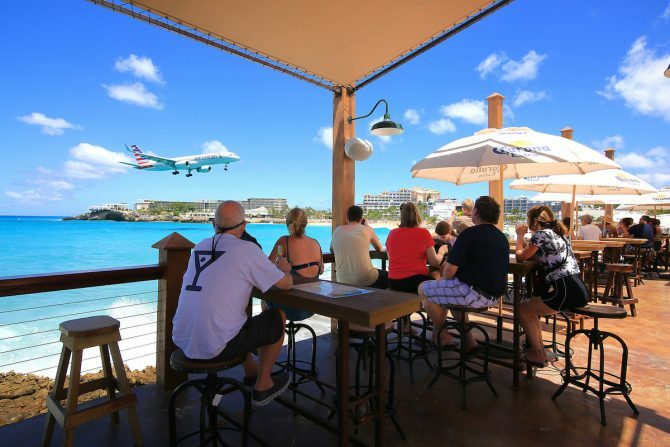 Saint Martin is famous for Maho Bay Beach, located adjacent to Princess Juliana International Airport, a popular spot for tourists and spectators who visit the beach to watch airplanes approach landing, passing only a short distance above their heads. 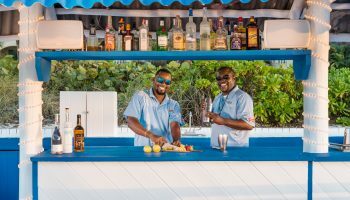 Sunset Bar and Grill is a great place to get in on the action while enjoying delicious food and drinks. You can also escape the saltwater and reserve a lounge chair at their new pool for $10. 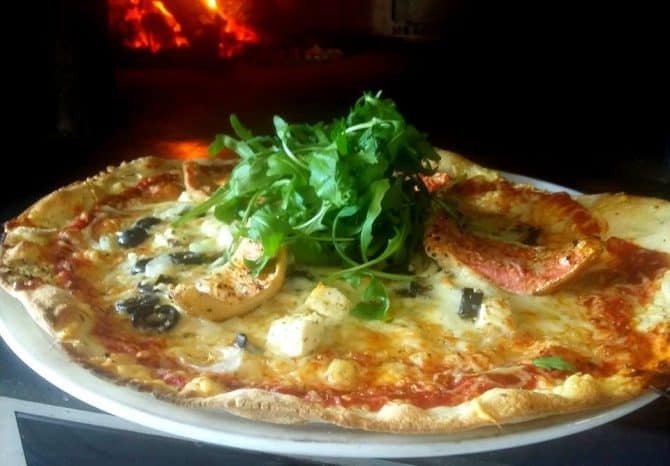 Pizza Del Sol, located in Simpson Bay (on the same street as Little Bamboo and Sale e Pepe) is an incredible Italian eatery serving up unique specialty pizzas and seafood. We recommend the Royal Pizza and the Goat Cheese & Honey Pizza. It is close to the Yacht Club making it a good place to have a hearty meal after a day at sea and after dinner, you can hit up the nearby bars for drinks and live music. 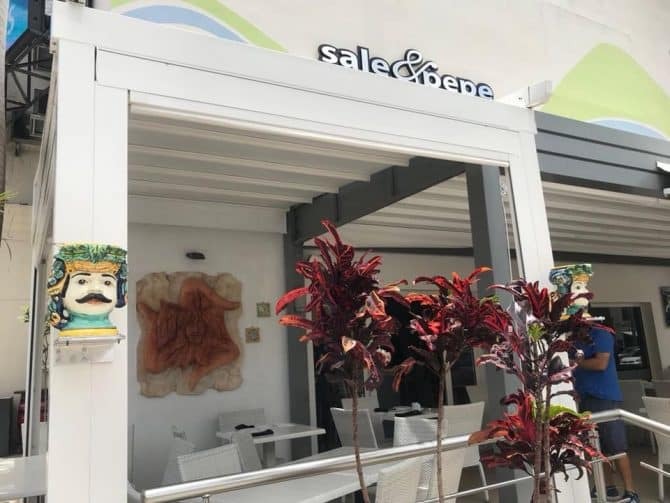 After being closed from damage after Hurricane Irma, this popular joint is finally open again! A family-owned restaurant, located behind Laguna Beach Hotel along the Nettle Bay Lagoon, La Cigale combines luxury with a warm, homey atmosphere. Choose to dine with your feet in the sand or have a table above the beach. The menu includes duck, veal and sea bass. 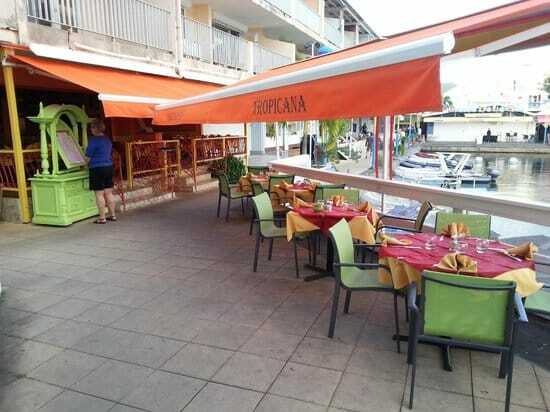 If you are looking for an al fresco spot to dine at in the Marigot Marina, Tropicana is our recommendation. This French restaurant is widely considered one of the best in regards to food, atmosphere, value and service. It is conveniently located near many hotels including Residence Le Pirate, Le Beach Hotel and Studio Marigot. We suggest ordering the lamb, chicken cordon bleu, lobster bisque and French onion soup. 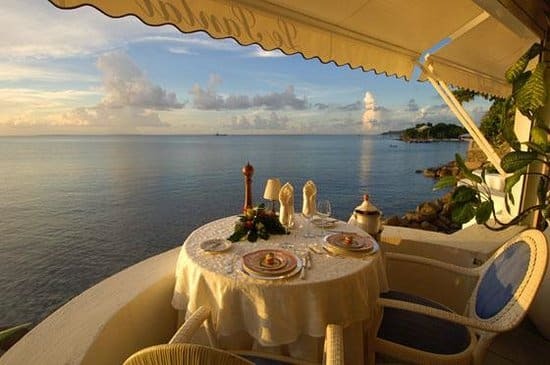 Searching for an ultra-luxurious romantic dinner? Le Santal is a five-star restaurant located in a stunning beachside villa on the French side of the island in Sandy Ground. This high-end French establishment offers dramatic seaside views and candlelight making it perfect for a romantic evening. 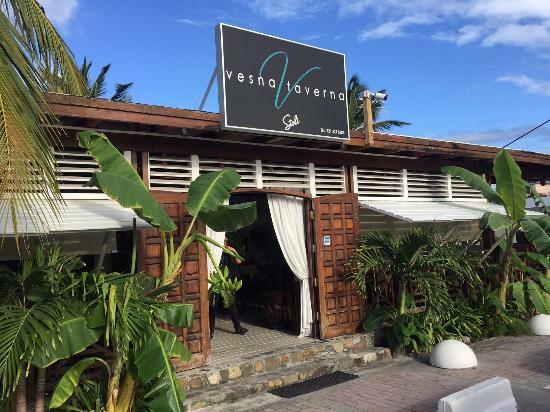 The island’s only authentic American-Greek-French restaurant, Vesna Taverna is a chic spot for breakfast, lunch or dinner. Centrally located in Simpson Bay and close to the marina, this is a great place to get some food before heading out on a boat tour. We suggest trying the Salmon Benedict for breakfast, the Taverna bagel for lunch and the Mahi Mahi for dinner.